Young Sheldon is a prequel series to The Big Bang Theory which follows the life of nine-year-old Sheldon Cooper as he starts high school in East Texas. Sheldon is a precocious boy genius growing up in a religious Texan home with a family who don't always know how to deal with his remarkable intellect. Iain Armitage (Big Little Lies) stars as the nine-year-old Sheldon Cooper. Zoe Perry, the real-life daughter of Laurie Metcalf who plays Sheldon's mother on The Big Bang Theory, stars as Mary Cooper. Lance Barber plays Sheldon's father George. Montana Jordan is Sheldon's older brother, George Jr, and Raegan Revord is Sheldon's twin sister Missy. In July 2017, it was announced that Annie Potts (Ghostbusters, Designing Women) had joined the show as a series regular, playing Sheldon's beloved grandmother, "Meemaw". Her character is described as a foul-mouthed, hard-drinking Texan grandmother who is very supportive of her grandson's intellectual talent. Meemaw was widowed in 1985 when Sheldon's grandfather, "Pop-Pop", passed away. Young Sheldon is a single-camera comedy (eg. The Wonder Years, Malcolm in the Middle), rather than the mutli-camera format of The Big Bang Theory. The show is narrated by Jim Parsons as Adult Sheldon. Jon Favreau (Iron Man, Elf) directed the pilot episode. Young Sheldon was created by The Big Bang Theory co-creator and executive producer Chuck Lorre and EP and Steven Molaro. Chuck Lorre, Steven Molaro, Jim Parsons and Todd Spiewak will serve as executive producers on the show, from Chuck Lorre Productions, Inc. in association with Warner Bros. Television. Steven Molaro is the showrunner of Young Sheldon, having previously done that job on The Big Bang Theory for five years. When does Young Sheldon air? The special debut of Young Sheldon aired Monday, September 25 at 8:30/7:30c after the eleventh season premiere of The Big Bang Theory. Young Sheldon returned Thursday, November 2 when The Big Bang Theory moved back to its regular Thursday night slot. Internationally, Young Sheldon airs on CTV in Canada, Warner Channel in Latin America and Brazil, Warner TV in Asia, and ProSieben in Germany. Since February 2018, Young Sheldon has aired in the United Kingdom on E4, which is also home to The Big Bang Theory. 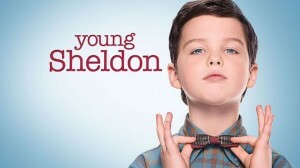 In January 2018, CBS gave an early renewal to Young Sheldon for a second season to air in the fall of 2018. CBS confirmed in May 2018 that Young Sheldon will keep its Thursday 8:30/7:30c slot, right after The Big Bang Theory, for the 2018/19 season.